The RTF to PDF Converter library for .NET can be linked into any .NET application, either ASP.NET web sites or Windows Forms applications, to add rtf to pdf conversion capabilities to your application. 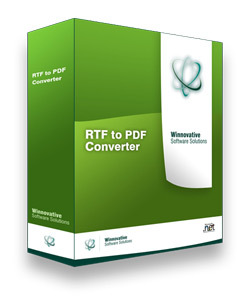 With the RTF to PDF Converter library for .NET you can easily convert RTF strings and files to PDF. You can obtain the PDF document either as an array of bytes or as a PDF file. The integration is extremely easy and no additional installation is necessary in order to get started. It's just a .NET assembly that you have to reference in your application. Samples and documentation are available in the downloaded archive. 22:             "attachment; filename=" + "Rendered.pdf" + "; size="